Envelopes are available in most business premises and online through www.swinfordgaa.ie where tickets can be purchased in bundles of 10/25/52 weeks. Next draw is in Moores on the 17th July. Draw envelopes are available at €2 each or 3 for €5. Our senior team maintained their 100% record in Division 4 with a hard fought win at Robert McCallion Memorial Park against Cill Chomain on Sunday 8th July by 0-17 to 1-12. Top scorer was Liam Moran with 0-10, followed by Michael Prendergast with 0-3, Jason McLoughlin 0-2, Darren Campbell & Jack McDonnell 0-1. The team are away this Sunday (15th) against Ballintubber. 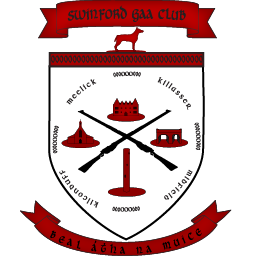 Swinford GAA club meeting on Friday 13th July 7pm in Gateway Hotel.